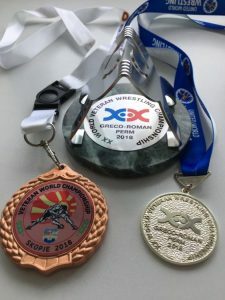 At the World Greco veterans Championships in Russia this past week NB Elite Coach Horton breezed to the finals where he lost on criteria to the returning champ 3-3. Horton (Div D 70kg) didn’t give up a point on his way to the finals against Domenico Piccinini (ITA). Coach Horton scored in the first period with a passivity point and a gut wrench (pic below). The Italian scored the exact same way in period two. Criteria gave Italy the win because he scored last. Coach Horton was the only American to win a 2018 Freestyle and Greco-Roman medal at the World Championships this year.